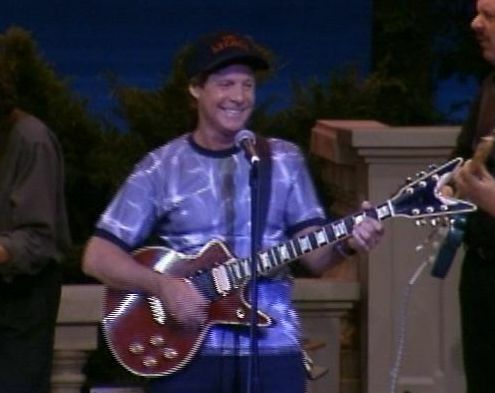 In March of 2000, Ron Dante was among several entertainers at the taping of the television special "Chapel of Love: Jeff Barry and Friends," which was broadcast on PBS stations throughout the U.S. later that year. Ron sang two songs, his very own "Sugar, Sugar" and a cool version of "Hanky Panky," and he did his usual great job on both! The special was later released on home video. Beginning on the next page are some stills from Ron's performances in "Chapel of Love." If you haven't yet seen this fantastic video, what are you waiting for? Below are direct links for you to purchase the video either on VHS or DVD; and, while you're at it, pick up a copy of the audio CD as well. The complete performance listing is at the bottom of this page.